After many years of thinking about it off and on, I finally decided to delve in to the world of Molecular Gastronomy. For those who don’t know, molecular gastronomy is the break down and rebuilding of foods on a molecular level. It’s sort of where chemistry and culinary arts overlap, and with my background in food, this seemed like the next logical step. To start out I bought the right chemicals and equipment; a crude beginners kit with some added tools. The kit included measuring spoons, pipettes, plastic tubing, a slotted spoon, and a few simple chemicals such as Agar-Agar, Sodium Alginate, Calcium Lactate, Soy Lecithin, and Xanthan Gum. 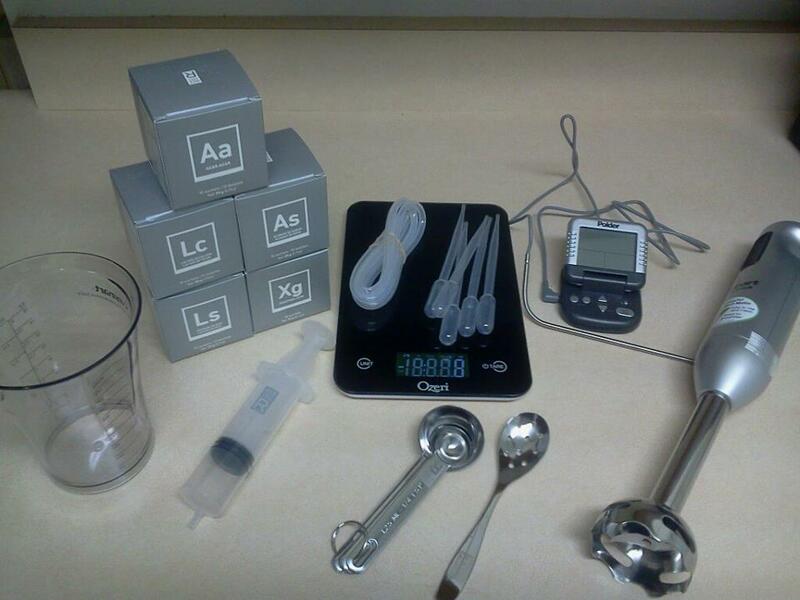 My beginner’s lab for Molecular Gastronomy. To aid me in my learning process I also picked up a few important pieces of equipment such as a juice extractor, a precise digital scale, digital thermometer with detachable probe, and an immersion blender. Here, I will document my first, and future experiments. First, I picked a fruit. I had a bag of granny smith apples that were wasting away, so I decided to sacrifice them in my quest to learn. 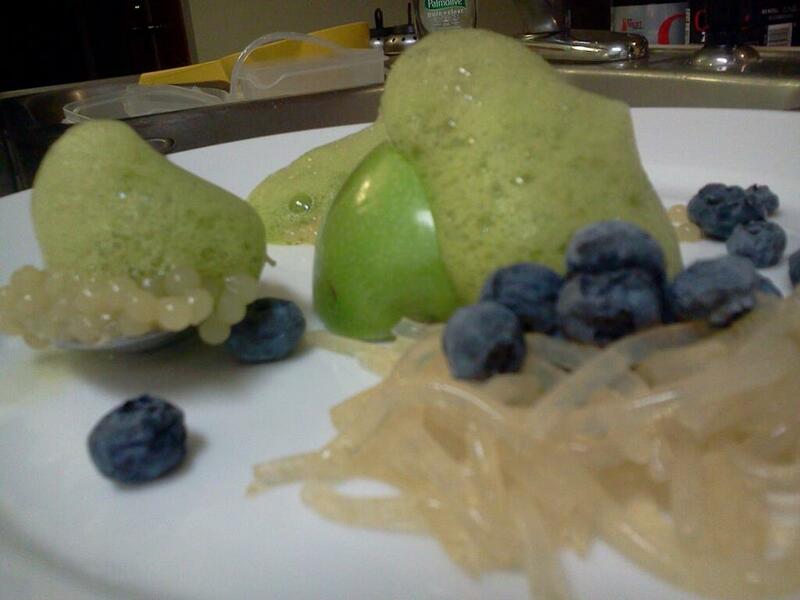 That being said, I made a Progression of Apple that included Apple Spaghetti, Apple Caviar, and a sweet apple foam. “Progression of Apple” consisting of Apple Spaghetti, Apple Caviar, and sweet Apple Foam. Next time I will add food coloring and see if I can alter the appearance. All in all though, they turned out pretty good..
To make the spaghetti, I first extracted 8 ounces of juice from the apples, placed it in a small pot, and added 1/3 cup of water and 2 grams of Agar-Agar. Stirring constantly, I brought the mixture up to a boil and immediately removed it from the heat as to not burn the bottom. I let this mixture cool to a safe handling temperature before piping it in to the syringe, and filling my plastic tubing. To allow it to set, I placed each tube in an ice water bath for approx. 2-3 minutes and used the empty syringe to blow air through the tubes, thus forcing out the spaghetti-like apple strings. Next time I will work with the mixture while it is still warm. I will also add a tablespoon of brown sugar before heating, to add a sweeter punch. I can also add a little bit of food coloring before placing it in the tubes to acquire different colored strands. I extracted 2/3 cup of juice from the apples, added 2/3 cup of water, and 2 grams of Soy Lecitin. I mixed this with an immersion blender until foam appeared on top, then let it sit for a minute to allow the juices to sink and settle at the bottom. Next time I’ll try adding whole milk to a foam using a different base.